These are some of the questions that Avatar Adi Da asks those in attendance during the 1980s gatherings presented on this CD. What unfolds is a lively consideration that you too can participate in, wherever or whenever you are, by listening to this CD. 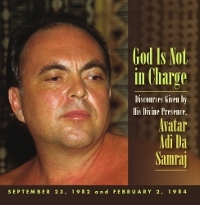 You will hear Avatar Adi Da directly address the false presumption of “God-as-Parent” that is fundamental to conventional religion. He describes the hierarchical nature of existence, in which there are countless beings who “cause” effects. 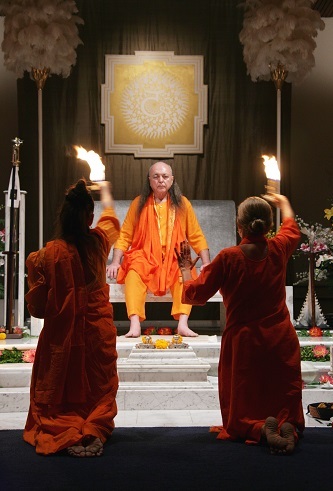 Adi Da then proceeds to call every individual to take responsibility as a causer of effects, rather than presuming childish dependency on a “Great Other”. Such self-responsibility, He says, is required for “gnosis”—or genuine experiential knowledge—of the human condition, of the Inherently Love-Blissful Condition of all beings, and of the unique role of the Spiritual Adept in Revealing That Condition. This “world” inheres in God, most certainly. There Is Only God. But that Realization is the expression of the gnosis that comes through “self”- transcendence. And only in the midst of such “self”-transcending gnosis are you transformed. Only in that case is your vision, or your view, transformed. And only in that case are you, as the “causer” of effects, transformed.